No matter your age, you’re sure to delight in this candle’s yummy fragrance. 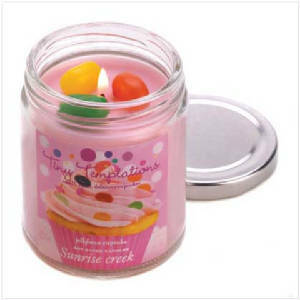 Scrumptious Jellybean Cupcake scent instantly brings to mind your happiest childhood days! 7.3 oz. 45 hours burn time. Lead free wick. Made in USA. Weight 0.8 lb. Soy blend wax with glass lidded jar. 2 3/4" diameter x 3 1/2" high. The fragrance of just-picked berries and smooth vanilla fill the air with the fragrance of fresh-baked country cobbler. A delightfully tempting fragrance that brightens the mood anywhere! 7.3 oz. 45 hours burn time. Lead free wick. Made in USA. Weight 0.8 lb. Soy blend wax with glass lidded jar. 2 3/4" diameter x 3 1/2" high.